The best camping in Wyoming. 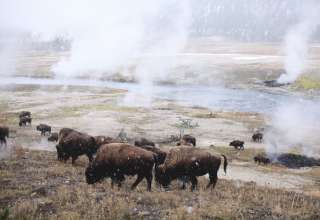 Geysers, bison, dramatic mountain ranges, and world-class fishing all await in the wild and rugged expanse of Wyoming. 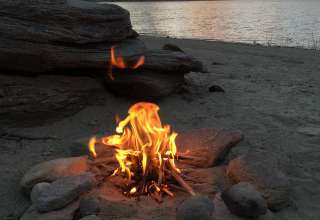 Camping in Wyoming evokes the feeling as though the opportunities for outdoor recreation are truly endless. Visit Grand Teton National park for world-class trout fishing, wildflower gazing, climbing, and mountaineering on some of the nation’s most stunning peaks. 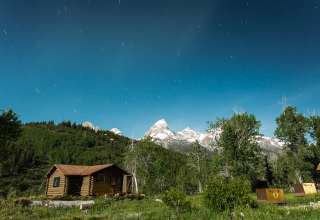 Within the southern section of the park you can camp in Jackson Hole, where you’ll be surrounded by nature, but still close to town. Head north from Grand Teton National Park to Yellowstone National Park—a true natural wonder where you can see hundreds of geysers, wild grasslands, incredible mountain ranges, bison, and maybe even wolves. 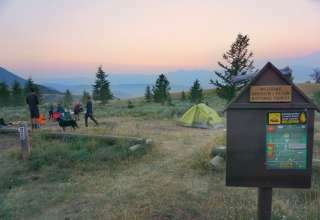 In the very north of the state you can camp, fish, hike, and climb among the vast beauty Bighorn National Forest. Further east, near the South Dakota border, you can visit Devils Tower National Monument to climb and to learn about the area's sacred history. Ease sore muscles by slipping into soothing waters at Hot Springs State Park, where you might be lucky enough to spot a bison mid-soak. Given the state’s expansive size and impressive array of state and national parks, RV in addition to tent camping in Wyoming is a popular way to see the state's sights. Home to more than 300 geysers and 290 waterfalls, Yellowstone National Park was the first place in the world to become a national park. Surprising to many, there are more than 30 islands within Wyoming. Get your kayaks ready. Popular among climbers and considered sacred among Native American tribes, Devils Tower was the country’s first national monument. Before becoming president, Gerald Ford worked as a seasonal park ranger at Yellowstone National Park in 1936. Though the ninth largest state by area, Wyoming has the smallest population.